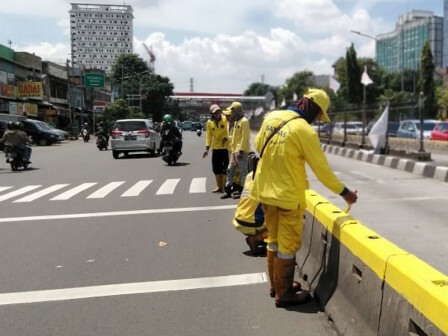 " It is targeted to be complete until Sawah Besar area this afternoon"
A moveable concrete barrier (MCB) on Jalan Gunung Sahari Raya is painted bright yellow to improve driver safety, street aesthetics, and minimize traffic accident. Its painting involves 10 officers of Bina Marga Sub-agency plus one operational vehicle. "This MCB is a barrier between Transjakarta bus lanes with other vehicles," he expressed, when being met at the location," expressed Work Field Supervisor, Aman Siboro, Monday (2/11). By so, it is hoped able to maintain the age of barrier structures. "It is targeted to be complete until Sawah Besar are a this afternoon," he said.